This true-color simulated view of Jupiter is composed of 4 images taken by NASA's Cassini spacecraft on December 7, 2000. The resolution is about 89 miles (144 kilometers) per pixel. As darkness falls tomorrow (Dec. 6), check out the east-southeast sky. You'll see a bright waxing gibbous moon, nearly 90 percent illuminated, and shining brilliantly to the lower right of the moon will be a brilliant silvery "star" gleaming with a steady glow. That's not a star, though, but the "king of the planets," Jupiter. The moon and Jupiter will be closest together during the afternoon, and they will be slowly separating during the overnight hours of tomorrow and Wednesday morning. During the evening they'll be separated by about 5 or 6 degrees (for comparison, your clenched fist held at arm's length measures about 10 degrees and the moon moves across the sky at about its own diameter each hour). Jupiter remains a bold light high in the east-southeast at nightfall. This week it doesn't set in the west until around 3:30 a.m. local time. Although brighter than any nighttime star, Jupiter blazes less fiercely now than in previous months. One glance toward the southwest before 6:30 p.m. local time will readily show that Venus outshines it. Jupiter appears to be levitating in front of the sparse stars of eastern Pisces, filling this region of the sky with overbearing brightness. As darkness falls over the eastern United States tomorrow, you'll see two of Jupiter's moons — Ganymede and Europa — on one side of the planet, while a third, Callisto, hovers by itself on the other side. As the evening progresses, notice how Ganymede and Europa will gradually pull away from Jupiter, but then at 8:21 p.m. EST (5:21 p.m. PST), a fourth satellite (Io) will emerge from Jupiter's shadow and l appear on the side of Jupiter occupied by Callisto. Slowly, as tomorrow night wears on, Io will become easier to see as it moves away from Jupiter and toward Callisto. Keep in mind that during this time, Jupiter's distance from Earth is increasing, from 34.8 light-minutes now to 37.7 light-minutes by the end of December (a light-minute is the distance light can travel in a minute — about 11 million miles, or 18 million kilometers). 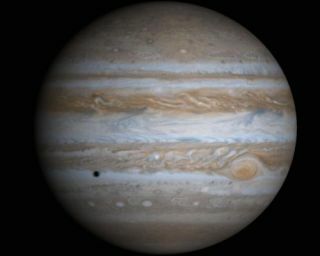 The apparent size of Jupiter's disk is therefore shrinking too; in fact, it will be nearly 13 percent smaller by year's end compared to when it was at opposition to the sun in late October. Nonetheless, Jupiter will continue to be a great target for those who might acquire binoculars or a telescope for the holidays over this upcoming winter season.